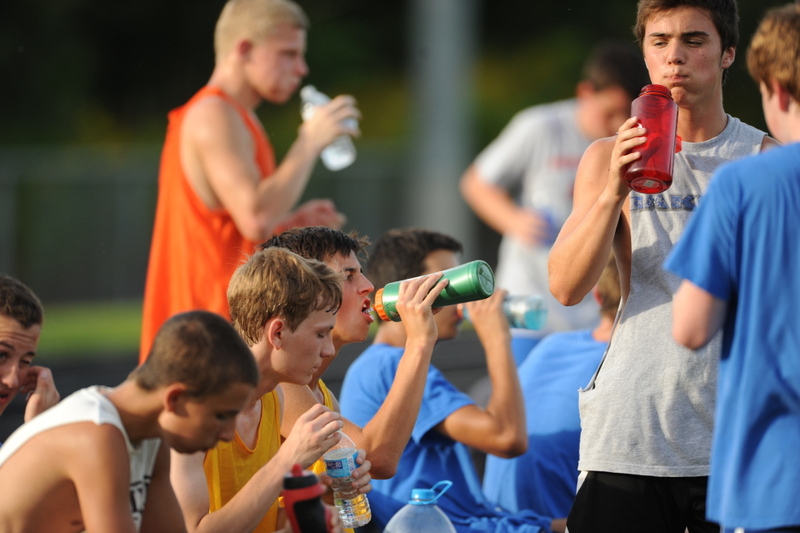 Area schools are working to prevent heat-related illness as fall sports practice gets underway in warm weather. Football players are supposed to be tough. Weekend warriors of the gridiron who can take a crushing hit and pop right back up to show their opponent they barely felt it — even if they did. Throughout the state of Maine football players and other fall sports athletes alike have eagerly tried to prove themselves on the practice field since training camp began Monday. In every huddle, however, toughness needs to stand should-to-shoulder with intelligence. As technology advances and information becomes more readily available, the more we learn as a society about the dangers that exist in athletics today. More importantly, we learn about the steps that can be taken to prevent potentially catastrophic injuries from happening. When it comes to potentially-fatal, heat-related ailments, Dr. William Heinz has a firm belief on whether or not they can be prevented. According to the March 2014 Annual Survey of Football Injury Research conducted by the National Center for Catastrophic Sport Injury Research, there have been 138 heat stroke fatalities in football between 1931 and 2013 — 52 of which have happened since 1995. The survey also reports that 90 percent of those deaths occurred during practices. Now, heat related illnesses are far from being an epidemic nationwide. In a release issued by the NFHS on Thursday, the organization estimated nearly 1.1 million student-athletes participated in high school in 2013, with the NCCSIR reporting zero fatalities due to heat stroke. That being said, it has happened and the Maine Principals Association is not taking the issue lightly — particularly considering it is one that is “100 percent preventable,” as Heinz notes. In the first two days, teams were limited to helmets and cleats only, no contact and no use of heavy bags, sleds or weighted items. Practices were limited to 2 hours and 15 minutes, with a mandatory three hours of rest in between double sessions. As the week progressed, practice time increased and more contact was introduced, all with the idea of gradually getting athletes used to the weather and practicing again. It’s something the MPA, according to Heinz, has really pushed in the past few years. “There really has been a big change in the thinking of coaches and administrators as far as heat illness is concerned and they really have gotten on board with it,” Heinz said. “Basically it was a matter of educating them and teaching them that the kids are going to be better if they’re acclimatized to the heat if you’re careful with how you practice with them in the heat. The increase in coaching education is something Oak Hill High School athletic director Jim Palmer has seen firsthand in his nearly 20 years of experience in high school athletics. Palmer said in addition to the MPA mandates, he addresses the matter of heat safety personally with his coaches as well. According to the Center for Disease Control and Prevention, “muscle cramping might be the first sign of heat-related illness, and may lead to heat exhaustion or heat stroke.” Symptoms of heat exhaustion — the less life-threatening of the two, yet still serious condition — include heavy sweating, weakness, nausea or vomiting, fainting, a fast, weak pulse and cold, pale and clammy skin. Heat stroke signs include high body temperature (above 103 degrees Fahrenheit), rapid and strong pulse, possible unconsciousness and hot, red, dry or moist skin. Gardiner AD Steve Ouellette said he takes similar steps to Palmer with his staff, but also noted that the increased prevalence of athletic trainers at both games and practices has helped. One of those trainers out on the fields is Steve Tosi, who has been employed at MaineGeneral Sports Medicine since 1992 and provides services to Lawrence High and Junior High Schools in Fairfield. From stretching calves to taping ankles, Tosi is one of nine athletic trainers employed by MaineGeneral that are stationed at area high schools. Part of Tosi’s work entails doing what he can to prevent situations, like heat-related emergencies, from happening. It sounds like a simple concept, but anyone who has ever dealt with teenagers can tell you how even the simplest things sometimes get overlooked. “I think everybody has that mindset that they need to drink and get that word to the kids, but that doesn’t mean the kids are doing that and that’s the problem,” Tosi said. “They’ve got other things on their minds. At least at the practices, athletes seem to be getting the message. Of course, staying hydrated and beating the heat are not problems only football players face. Ian Wilson is entering his eighth season as the head coach of the Waterville girls soccer team, and also served as the Purple Panthers track coach for 18 seasons before accepting a position with the Colby track team this summer. Wilson provides similar instruction to his girls soccer team. Wilson has also noticed the increase in the amount of information that has become more readily available, as the first introduction he had to heat exhaustion was when he was attending Bates College in the late 1980s. Fortunately for Wilson’s team and those starting the fall sports season this past week the weather has been very mild, even by Maine standards. Next week may be a different story with temperatures potentially reaching the mid- to high-80s in some areas, but it is something area schools are planning for and expecting.